Trusty's Hill, Fort, RCAHMS site plan. Tif derived from publication illustration. Trusty's Hill, Fort. 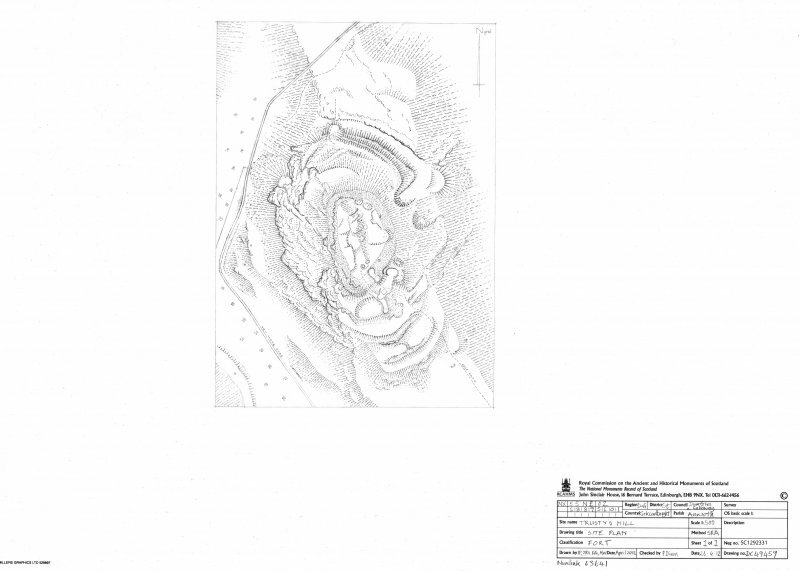 RCAHMS field survey measured drawing. General view of Trusty's Hill from the NW. 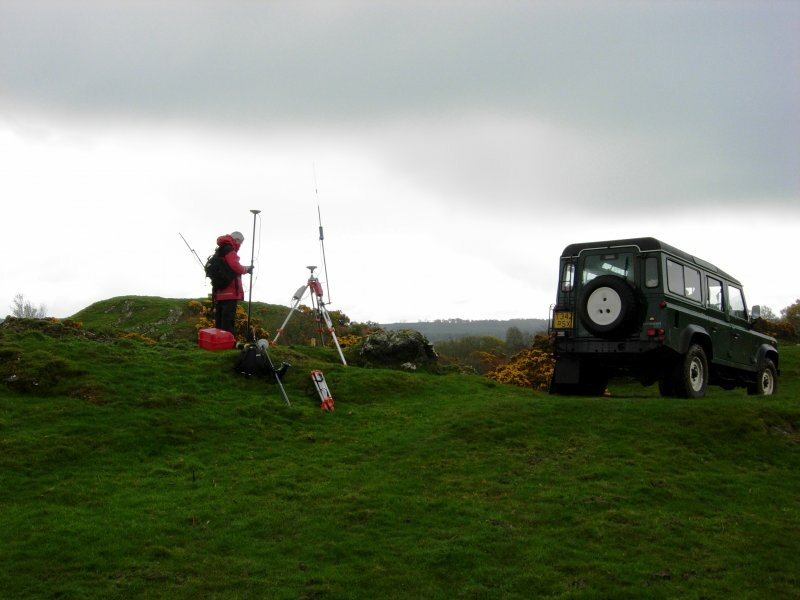 dGPS survey station at Trusty's Hill. Excavations carried out in 1960 revealed occupation relating to two periods. The first, an Iron Age fort; an area 50' by 80' on the summit being enclosed by a 4' wide timber-laced stone wall. An oval stone guard-hut built in a natural hollow outside the entrance on the SE and a massive rock-cut ditch across the neck of the promontory to the NE also belong to this period. In the 6th - 7th centuries AD, additional ramparts of poorer type with external revetment only were constructed outside the entrance, and possibly timber huts inside. A group of class I Pictish symbols (NX55NE 2.02) are cut on a rock outcrop at the fort entrance, and now protected by an iron grille. No dateable finds were made. J R Allen and J Anderson 1903; C Thomas 1961. As described and planned above. There is another hut site, about 11.0m in diameter, on the W side of the entrance, but no trace of timber huts could be seen within the interior. This small fort occupies the craggiest summit of the Boreland Hills, an area of scrub and rough pasture to the W of Gatehouse of Fleet. Although the defences of the fort have been severely robbed, enough remains to show that they comprise a central enclosure with outworks on the NNE and SSE. The central enclosure measures about 23.5m from NNW to SSE by 15m transversely within a rampart reduced to little more than a grass-grown scarp. The results of excavations conducted in 1960 (Thomas 1961) suggested that this rampart is only about 1.2m thick, but it appears to be far more substantial than that and the pattern of robbing on the N implies a thickness of the order of 4m. Several pieces of vitrified stone are visible along the course of the rampart. The configuration of the inner defences around the entrance at the SSE end of the fort is uncertain. On the W side of the entrance the rampart extends beyond the rampart terminal on the E side, and there are traces of low banks dropping down on either side of the entrance-way; these banks were regarded as secondary to the inner rampart by the excavator, although the junction between them has never been excavated. To the S, the entrance-way drops down between two large rock outcrops, which have been incorporated into the defences of the fort by hornworks running along their crests and petering out on the E and W slopes of the hill respectively. Outside the hornwork there are traces of a third rampart which cuts across the hill on the crest of a rock outcrop some 1.5m in height. About 4m beyond it there is a fourth rampart, the greater part of it consisting of a rock outcrop. Excavation has shown that both these ramparts were externally faced. On the NNE, the other easy line of approach to the fort, there is a rampart 3m thick and 0.5m high with an external rock-cut ditch 4m broad and from 1.5m to 3m deep. A section cut across this rampart and ditch in 1960 showed that the rampart has both inner and outer faces; a break-in-slope above it on the N side of the fort marks another line of defence. The only internal features of the fort are an excavated hut set between the hornwork and the inner rampart on the E side of the entrance, and the Pictish symbols (NX55NE 2.02) carved into the living rock immediately to the W (Anderson and Allen 1903). Visited by RCAHMS (SPH), 21 February 1990. 13. Fort (vitrified), Trusty's Hill. In an undulating region of rocky hillocks, and midway between the church of Anwoth and Gatehouse-of-Fleet, there rises a hill, more conspicuous than its neighbours, to a height of between 150 and 200 feet, and known as Trusty's Hill. It lies with its main axis north-west and south-east, slopes up by a gradual incline from the latter direction, and is steep, and in places craggy, on the flanks and at the north -west end. Towards the north, at a level some 30 feet or thereby below the summit, it is connected by a neck with rising rocky ground beyond. 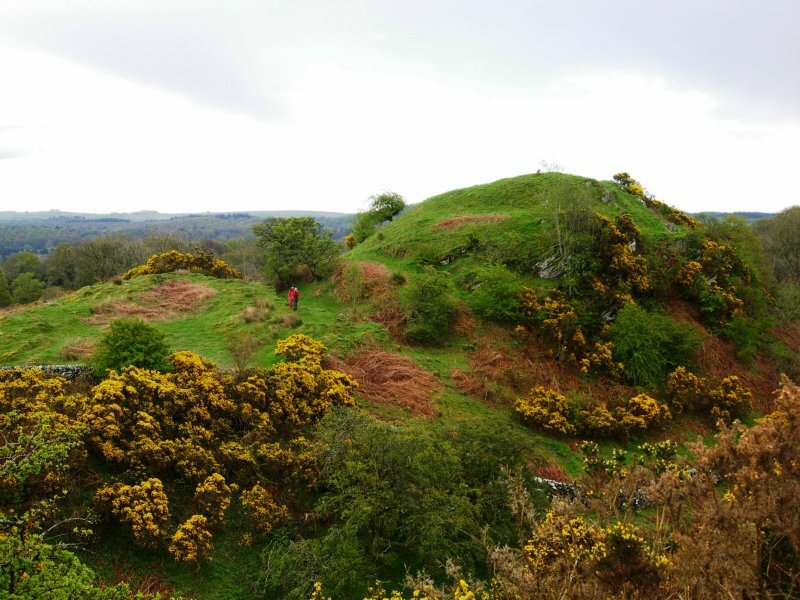 The summit of this hill is crowned by a fort reputed to be vitrified, but though vitrified material is still to 'be picked up on it s surface, where the summit rampart has not been torn up, it is so overgrown with turf that it is impossible now to estimate the extent of the vitrifaction. The actual summit, which is very uneven, measures some 95 feet in length by 64 feet in breadth. It has been surrounded by a stony rampart or wall , enclosing at its south-east end, and at some 6 feet lower level, two projecting rocks 11 feet apart, between which has evidently been an approach. On the top of each rock there is an artificial hollow, that on the north circular with an interior diameter of 11 feet and a depth of about 2 feet, that on the south sub-oval measuring diametrically 31 feet by 23 feet. Some 15 feet or thereby out from the face of these rocks there passes segmentally from the south side to within 25 feet of the north edge of the ridge a breastwork , for the most part composed of outcropping rock. It in turn has been covered at 21 feet distant down the slope by another outwork (from the surface of which low point s of rock also protrude), visible to within 12 feet of the north edge and thereafter seeming to return uphill so as to flank the approach which has passed along the edge of the north slope. Beneath this lowest outwork the hill extends in a somewhat level plateau towards the south-east before descending with a steepish gradient to its base. To defend the fort from attack on the north by way of the neck before mentioned, a deep trench has been cut across that feature in part through the rock, 14 feet in width, 10 to 11 feet deep on the scarp or higher side, and 5 feet on the opposite slope, while the steep scarp has been rendered more formidable by the addition of a stony rampart along its crest, about11 feet in thickness a t base. At its extreme west end , where it approaches the craggy face of the hill , the course of the trench has been interrupted by an approach to the interior passing by the termination of the surmounting rampart. The plan in the Proceedings (vol. xxvii) probably represents the best that can be done with this wrecked fort. The whole of the inner wall appears to have been vitrified, since abundant vitrifaction was observed round the summit of the hill and on all four sides at the date of visit, but the outer defences on other hand exhibited no trace of vitrifaction. Visited by RCAHMS 12 June 1951. This small fort was surveyed by RCAHMS in April 2012 in advance of excavation there by the Galloway Picts Project in May and June. In lieu of the results of that work, the following account is limited to a description of the physical remains and it should be read with reference to the annotated plan SC1309006. The fort comprises a hilltop enclosure (I), defined by a thick wall running around the crest of the summit, with two further lines of defence to the N and S. The first of these is a second wall (II) about 7m down the slope, the third an outer wall (III) which is accompanied by a massive external rock-cut ditch. The summit enclosure is sub-oval on plan, measuring about 29m from N to S by 17m transversely within the remains of a timber-laced wall that has been reduced for the most part to a low grass-grown stony bank up to 5m in thickness. That this wall has been burnt is evident from the fragments of vitrified material visible both in the surviving bank and in the scree below. On the W side of the fort in particular the wall has been heavily robbed, with the pattern of the scarring indicating that the robbers dug into it from the outside, only stopping when they reached and removed the inner wall-face. This robbing was probably carried out to provide stone for the drystone dyke that runs along the western foot of the hill. Certainly, the deliberate casting down of wall material would account for both the massive amount of loose scree towards the foot of the slope and the presence within the dyke of lumps of vitrified wall-core. 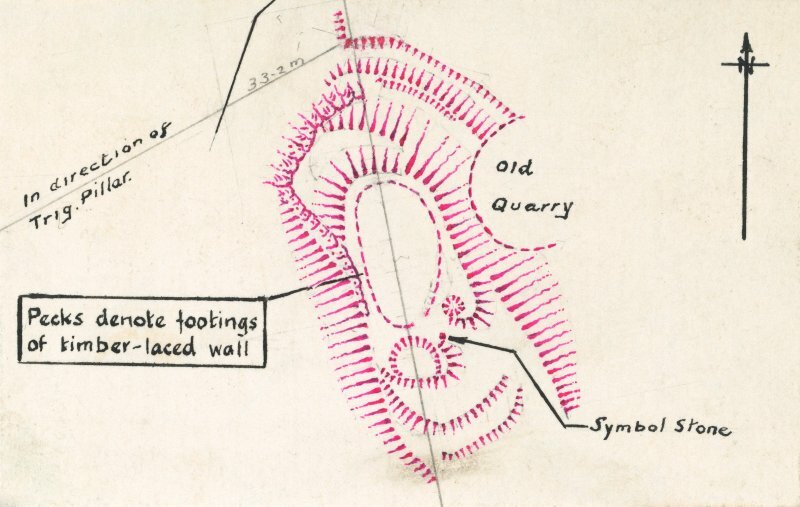 It may also provide a context for the saddle quern (NX55NE 172) incorporated into the wall, which was identified during the course of the survey. The pattern of the robbing of the rampart in relation to the natural topography, especially the top edges of vertical rock-faces, also demonstrates that on the W side at least the original timber-laced wall could not have been more than about 4m in thickness. The entrance to the enclosure, though it may not be original, is on the S, where there is a distinct dip in the surface of the bank and where it is approached from the S by a passage that lends its way between two prominent rock outcrops, the W one bearing carvings of Pictish symbols (NX55NE 2.02). The interior of the summit enclosure is characterised by a spine of bedrock that runs the length of the interior and separates the higher western half from the lower eastern half. Several low scarps within the former are suggestive of building stances or platforms but none is definitive; the area of the latter is dominated by the spoil-heaps and trenches of Charles Thomas’ excavation in 1960. The first outwork (II) is situated only a little way down the slope from the summit fort but the relation between the two is not at all clear. On the N, this line is indicated by nothing more than a bank or wall that has been cast down to form a 15m long crest with a flat area behind. It runs from the naturally steep cliff-edge on the W to a point where it would have started to arc around the NE flank of the hill. Any evidence that it did indeed continue is now masked by the grass-grown scree from the ruined timber-laced wall above. At the S end, this wall again appears to have run for a distance of at least 8m from the steep natural slope on the W, along the crest of a narrow terrace to a point where it is interrupted by what appears to be a continuation of the spine of rock visible in the interior. The NE side of this spine forms the SW side of the sunken approach to the entrance but there is no indication that the bank turned back along this spine to meet the wall of the inner enclosure. There is also no visible evidence that the outwork continued to the NE of the entrance passage, the area where it might be expected to be seen being obscured, at least in part, by the spoil cast down the slope from the excavation of the well or cistern. It may be the case, however, that the fort builders thought that a sufficient obstacle was provided by a steep natural rock-face, one of several NE and SW orientated seams of outcrop on the E flank of the hill. The outermost outwork (III) again runs from the steep natural slopes on the W to the still steep but far less craggy E flank of the hill. Excavation by Thomas at the N end of the fort showed this line to comprise a wall with an outer drystone face fronted by a rock-cut ditch measuring some 50m in length and up to 5m in breadth. The eastern end of this feature has been lost to quarrying but it is unlikely to have extended much further onto the ever-steepening E flank of the hill. On the S, the feature takes a slightly different form. The wall extends a distance of about 30m from the steep W slope along the leading edge of a terrace, the front face of which has been artificially steepened by quarrying away rock from its foot. There is no outer edge per se to this feature but at a distance of 4-7m from the scarped slope there is a low stony bank that Thomas interpreted as a rampart. However, it is difficult to see how such a low feature could have served any useful defensive role and it is more likely to be the equivalent of a low counterscarp bank formed with spoil thrown forward from the enhanced face of the terrace. Within the intervening gap are what may be the remains of a small oval or subrectangular building (IV), its E end defined by a low stony bank, its N side by a low scarp and its S side by the low bank running along the crest of the terrace. No trace is visible of its W end. Situated immediately SW of the entrance passage, between the wall of the summit enclosure and the first outwork, is a oval stance (V), which measures about 9m from NE to SW by 5m transversely and may indicate the site of a timber building. On the S, its front is marked by the flattened remains of the first outwork bank and it is here that any entrance is likely to have been situated; its E side is defined by the spine of rock forming the SW side of the entrance passage; and on the W and N there is a deep cut into the natural slope. One of the trenches dug by Charles Thomas in 1960 traversed the back of this feature but the results were inconclusive. The well or cistern (VI) is situated on the SE flank of the hill immediately below the summit fort and on the NE side of the entrance passage opposite the Pictish carvings. The remains visible at the time of survey represented an overgrown reconstruction undertaken after the incomplete and inconclusive excavation by Thomas. The quarry on the NE flank of the hill that has truncated the outer defenses is undated, though it is unlikely to be earlier than late-18th or early-19th century, when the drystone dykes in the vicinity are most likely to have been built. The quarry comprises two pits, the more northerly representing the end of a long trench that has followed a seam of rock upslope from the NE. The quarriers have evidently found a reason to widen and deepen their trench at the upper end and this has resulted in the formation of a considerable spoil-heap. The southerly pit is much smaller but it, too, appears to have followed a NE and SW orientated seam. Visited by RCAHMS (JRS, GG, IP, ATW) 12 April 2012. As part of the 150th anniversary of the founding of the Dumfriesshire and Galloway Natural History and Antiquarian Society, the Society launched a programme of excavation and survey of Trusty's Hill Fort in 2012 in order to recover, for modern analysis, the environmental and dating evidence not recovered in the previous excavation and so enhance understanding of the archaeological context of the inscribed stone at Trusty's Hill and the significance of this archaeological site within the context of Early Medieval Scotland. The archaeological fieldwork comprised a topographic GPS survey to establish a modern plan and 3D model of the entirety of Trusty's Hill; the re-excavation of previous excavation trenches and limited sample excavation in order to recover and record environmental and artefactual evidence from secure archaeological contexts and a detailed laser scan survey of the Pictish inscribed stone. The archaeological excavation was undertaken by 65 volunteers in collaboration with GUARD Archaeology Ltd, the Royal Commission on the Ancient and Historical Monuments of Scotland and the Centre for Digital Documentation and Visualisation LLP. NX 5889 5601 As part of the 150th anniversary of the founding of the Dumfriesshire and Galloway Natural History and Antiquarian Society, the society launched a programme of excavation and survey of Trusty's Hill Fort, 20 May – 15 June 2012, in order to recover for modern analysis, the environmental and dating evidence not recovered during the only previous excavation of Trusty's Hill, undertaken by Charles Thomas in 1960. The purpose of the project was to enhance understanding of the context of the inscribed stone at Trusty’s Hill and the significance of this archaeological site within the context of early medieval Scotland. The fieldwork consisted of a topographic survey by RCAHMS to establish a modern plan and 3D model of the entirety of Trusty’s Hill. The re-excavation of previous excavation trenches and a limited sample excavation was then undertaken by 65 volunteers in collaboration with GUARD Archaeology Ltd, in order to recover and record environmental and artefactual evidence from secure archaeological contexts. A detailed laser scan survey of the Pictish inscribed stone was then undertaken by the Centre for Digital Documentation and Visualisation LLP. 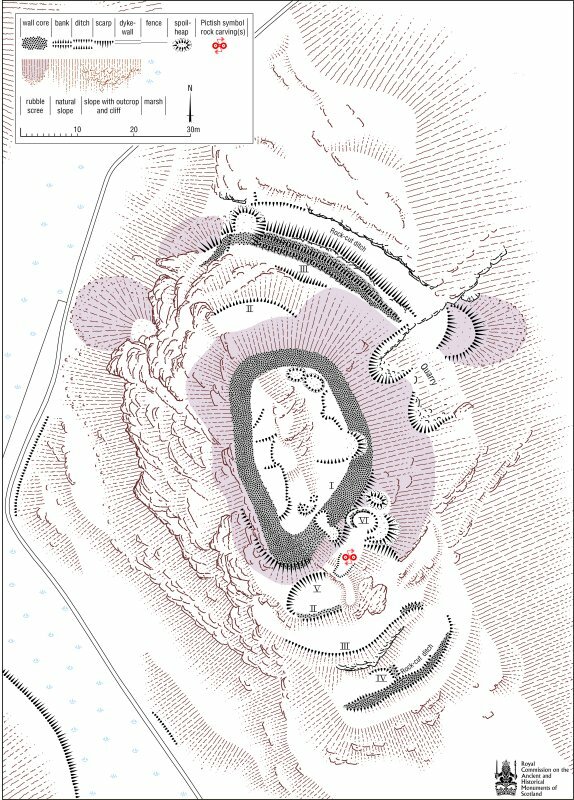 The topographic survey updated the measured sketch plan produced by Thomas and shows that the site consists of a fortified citadel around the summit of a craggy hill, with a number of lesser enclosures looping out from the summit along the lower lying terraces and crags of the hill. It therefore recognisably conforms to the definition of a nucleated fort. Four of Thomas's seven trenches were re-excavated. Trench 2 revealed a deep rock-cut basin on one side of the entrance to the hillfort, opposite the Pictish Inscribed Stone. This feature contained waterlogged deposits from which wood and other organic material were recovered for archaeobotanical analysis. Trench 4, on the E side of the interior summit of the site, encountered part of the vitrified rampart and associated 'dark soil' occupation deposits across an area of the interior. Excavation of these deposits recovered numerous animal bones, charcoal, worked stones and lithics, metalwork, metalworking debris and a rim sherd of 6th/7th AD century E Ware. Trench 5 on the W side of the interior summit of Trusty's Hill, also encountered part of the vitrified rampart along with associated occupation deposits also containing numerous animal bones, charcoal, worked stone and lithics, metalwork, metalworking debris, an Iron Age glass bead fragment and a rim sherd of 1st/2nd-century AD Samian Ware. Trench 6 revealed the sterile fill of the rock-cut ditch on the N side of the site. Radiocarbon dates taken from a variety of contexts across Trenches 2, 4 and 5 appear to demonstrate residual Iron Age occupation of the hill at c400 BC followed by a hiatus before the site was re-occupied perhaps starting in the 5th century AD, and flourishing in the 6th century AD before occupation of this hillfort ceased before the middle of the 7th century AD. The rock-cut basin opposite the Pictish Carvings, however, appeared to have continued in use beyond the late 7th to late 8th century AD. The laser scan survey of the Pictish inscribed stone demonstrated that there is no ogham along the southern edge of the inscribed stone, nor is there a cup-mark above the 'sea-beast', apparent on a previous laser scan survey. The 2012 laser scan also confirmed that the z-rod and double disc symbol do not interweave as depicted previously, but intercut each other across the lower bar of the double disc. Furthermore, the horned head at the bottom of the inscribed stone clearly cuts one of the inscribed signatures, demonstrating that the horned head is not ancient, but rather another element of the 19th-century graffiti only too evident across the rest of the inscribed stone. Occupying the craggiest knoll in the Boreland Hills, this small fort has been excavated twice, first in 1960 (Thomas 1961) and more recently in 2012 (http://gallowaypicts.com/wordpress/). It is roughly oval on plan and its innermost enclosure crowns the very summit of the knoll, enclosing an area measuring no more than 25m from N to S by 15m transversely (0.03ha). This innermost wall has been heavily robbed, but it was timber-laced and at least 5m in thickness, around the E forming a massive scree of rubble spilling down the flanks of the knoll; pieces of vitrified stone can be found amongst the rubble. The entrance is on the S, and gives the appearance of a ramp dropping obliquely down the slope past the well-known early medieval carvings cut into the living rock on the W, and the structure enclosing a rock-cut basin on the E. Short lengths of several outer ramparts can also be seen on the spine of the knoll on the N and SSE, essentially enhancing minor topographical features. On the SSE these comprise: a stony bank that now forms the leading edge of a platform cut into the slope above the carvings on the W side of the entrance; below which another stony scarp extends along the edge of a natural terrace; at the foot of which a ditch has been cut into the living rock and is flanked externally by a bank of upcast. On the N, about 9m beyond the inner wall, a stony scarp extends along the top of a steep slope dropping down to a terrace behind a thick stony rampart, which Thomas demonstrated was faced externally (1960) and is fronted by a rock-cut ditch some 5m in breadth. There is no visible evidence that any of the outworks at either end were linked to form continuous barriers. While one of the radiocarbon dates from the most recent excavations falls in the middle of the first millennium BC, The timber-laced wall is securely dated to the early medieval period, correlating with an extensive assemblage of imported goods and metalworking debris from the interior.